One of our ESXi 5.1 hosts entered a disconnected state with reason unknown. When I logged into the console of the server and checked the network settings everything checked out. Then I went into the ESXi shell to see what the network interfaces looked like and here laid the problem… the management vmkernel interface was not enabled. Okay, no big deal…. that is a easy fix! But when I tried to enable it I received a “Unable to kill DCUI” error. I could not find any information about this error anywhere. With this production ESXi host disconnected and roughly 40 virtual machines still running on this server I admitted defeat and opened a support case with VMware. First we need to find the processor ID of the DCUI. Now kill that PID, it will not return anything if successful. Perform a interface list and that disabled vmk should be enabled. Check to see if your host is pingable again. If anyone else received this error, please comment with your scenario and results! VMware vSphere 6.0 available for download!! Windows 10 coming Summer 2015! Does this kill the DCUI on the console though? Do you need to run “/etc/init.d/DCUI start” afterwards to ensure the console works? Just wondering. Good question! When I killed the DCUI it started back immediately, didn’t have to manually start it back. What would happen when you kill DCUI — I mean is there is something that you need to keep in mind. DCUI is something that we can check via ilo …. so when you kill it then the screen wont come up on ilo screen? Worked 100%. Thank you. Had this issue with ESXi 5.5 and iSCSI vmnik port binding/LUN mapping. Removed switches, etc., nothing until the DCUI PID was killed. 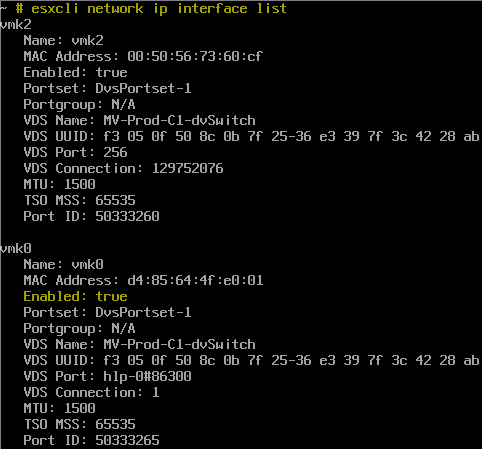 Re-added switches for iSCSI and discovery is working. Thanks again! You saved my night too! Migrating vmnic and VMKs (Management and vMotion) from VDS to VSS. The migration failed and the Management VMK ended up disabled. Killed the DCUI and it came straight back.